There is a time to wear a cycling jersey and a time for wearing a cycling waterproof jacket. And there’s another time for popping on an insulated cycling jacket. It can be a bit confusing so here’s how I choose my cycling tops. Cold, wet and wind: Waterproof and windproof cycling jacket (preferably Gore-Tex). The B’Twin Membrane cycling jacket 7 (there are male and female versions) fits into the cold and dry (or mostly dry) category. Two large pockets at the back. This is a good looking and fairly well-fitting women’s winter-warm cycling jersey (the hips were a bit wide for me but I have quite narrow hips so I expect most women would like the fit). You do need to choose the right conditions to wear this for optimum performance, such as a cold but dry-ish day in winter, early spring or late summer. The aim is to have a fairly neat fit and to wear the jacket over the top of several thinner baselayers. When I did this I found that I stayed wonderfully warm. The stretch in the fabric allows for good freedom of movement. The jacket fabric is good at keeping out the wind and some drizzly rain but also allows any sweat that builds up through exertion to evaporate (or wick away). When it get s bit chillier (such as when descending a hill) I liked being able to bring out the long neck warmer and zipping it up over my chin. When not in use the neck warmer lies flat inside the jacket and to the back of your neck. This is such a great idea and something that the Decathlon cycling jacket designers should be proud of. The jacket zip is full-length and the back pocket is also zipped, so it offers good security. While the main part of the jacket feels robust and durable (it needs to be to keep the wind out) the sleeve cuffs and neck warmer are made from a softer fabric that feels wonderful against the skin. The jacket arms are also nice and long (so you will not suffer from cold wrists even if you have Mr Tickle-long arms like me). 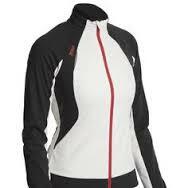 The black and white contrasting fabrics, coupled with a salmon pink zip, creates a good-looking jersey. I like the addition of the reflective detailing at the arm cuffs. This is a good quality jacket that can justifiably compete against other more well-know cycling brands such as Gore, Giordana and DHB. The B’Twin Membrane cycling jacket 7 RRPs at £54.99 from Decathlon, which really does make it a competitive buy when compared to other brands.